The ever changing world of technology, and complex business environments are driving a global village to strive for economic advancement, as it is the only path toward prosperity of the global economy. Generally, the terms Economic Development and Economic Growth are used by the economists to define the concept of economic advancement, wherein, growth represents the continuous increase in per capita income of a country. Development or economic development, on the other hand, is more comprehensive and broader in scope as compared to the economic growth. When we talk about development, it is usually focused on “economics”. The word development and economic development are used interchangeably when you talk about the well-being of a country. Economic development is related to the increasing level of income in a society or a country, and its related increase in savings, consumption and investment. It is, therefore, a wider concept than the economic growth, because if income is not distributed fairly in a society, growth may never be achieved, or there will be no progress in a country, which eventually leads to a failure to achieve goals that are linked with the economic development. It represents a number of structural changes in various sectors of an economy, including occupational structure, structure of industrial production, structure of technology, structure of national output, structure of foreign trade, and social and institutional structure. Economic growth is achieved gradually over a number of years, sometimes decades. It is a slow and long term process, which shows a higher level of increase in real per capita income as compared to the increase in population. 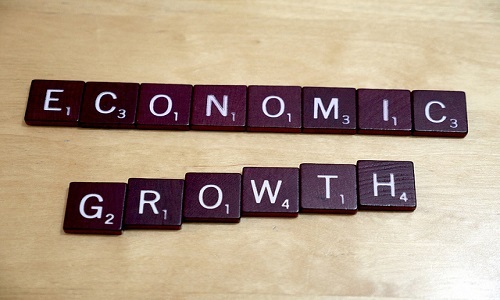 Growth of any economy is associated with an increasing level of productivity of an economy, which is linked to the decrease in unemployment and poverty. As already discussed, when you talk about economic development, it implies the changes in income, investment, savings and consumption, which brings the progressive changes, such as technological changes and institutional changes, in the socioeconomic structure of a country. When you talk about economic growth, it implies an increase in the real output of goods and services in a country. Economic development includes the factors, such as, growth of human capital indexes, a reduction in the number of inequalities, and structural changes to improve the overall quality of life in a society. On the other hand, economic growth represents a slow increase in the components of GDP, including net exports, government spending, investment and consumption. Economic development is measured qualitatively with the help of literacy rate, infant mortality, Qualitative Human Development Index (HDI), Human Poverty Index (HPI) and Gender Related Index (GDI). Whereas, Economic Growth is measured quantitatively with the increase in real Gross Domestic Product (GDP). So it can be said that development brings qualitative as well as quantitative changes in any economy and growth represents the quantitative changes. Economic development is a metric to estimate the quality and progress of life in developing countries, and economic growth is more relevant to measure the progress in developed nations. However, growth is used in all the countries of the world as a measure to calculate the overall economic advancement as it is a key condition for economic development. Hira Waqar. "Difference between Growth and Development in Economics." DifferenceBetween.net. August 15, 2015 < http://www.differencebetween.net/business/difference-between-growth-and-development-in-economics/ >.